This caddy is now with a museum to be announced shortly. 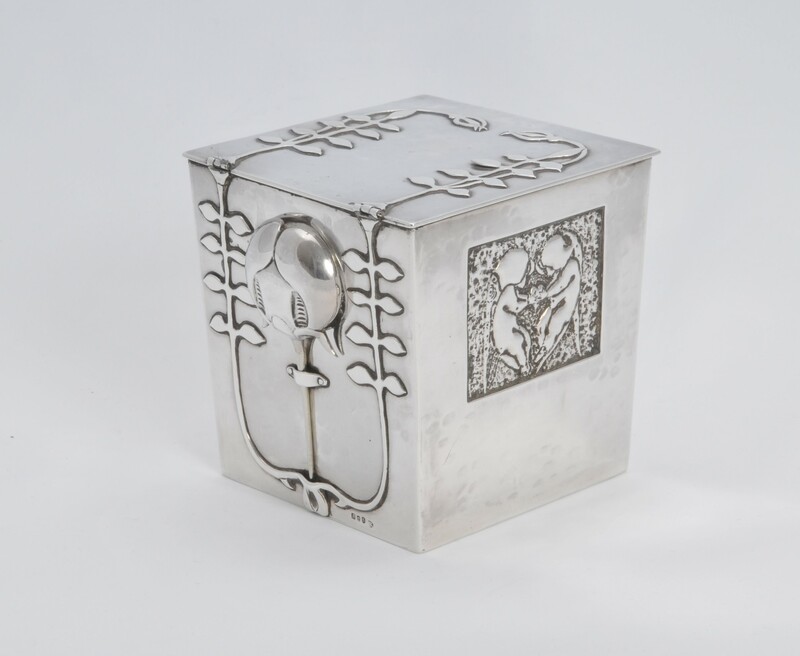 A very special and rare piece of Glasgow School silver by James Herbert McNair, with additional contribution by his wife Frances Macdonald McNair. They both were part of the Glasgow Four and friends and later brother and sister in law to Charles Rennie Mackintosh and Margaret Macdonald (Frances sister). James Herbert McNair studied and worked with his close friend Charles Rennie Mackintosh at the Glasgow School of Art and Honeyman and Keppie architects around 1890-5. Both exhibited works together throughout the 1890’s culminating in their highly acclaimed and influential exhibits at the 1902 Turin Exhibition prepared with their respective wives, the Macdonald sisters. McNair’s work is extremely scarce in any medium, most being held by Liverpool and Glasgow Museums. 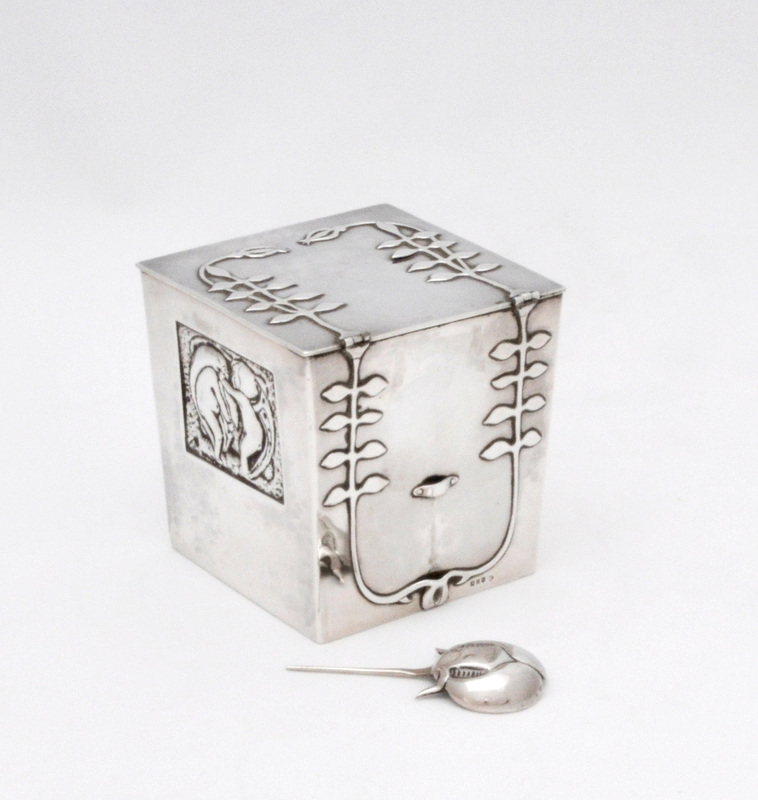 Sterling silver pieces by any of the Glasgow Four are exceptionally rare. 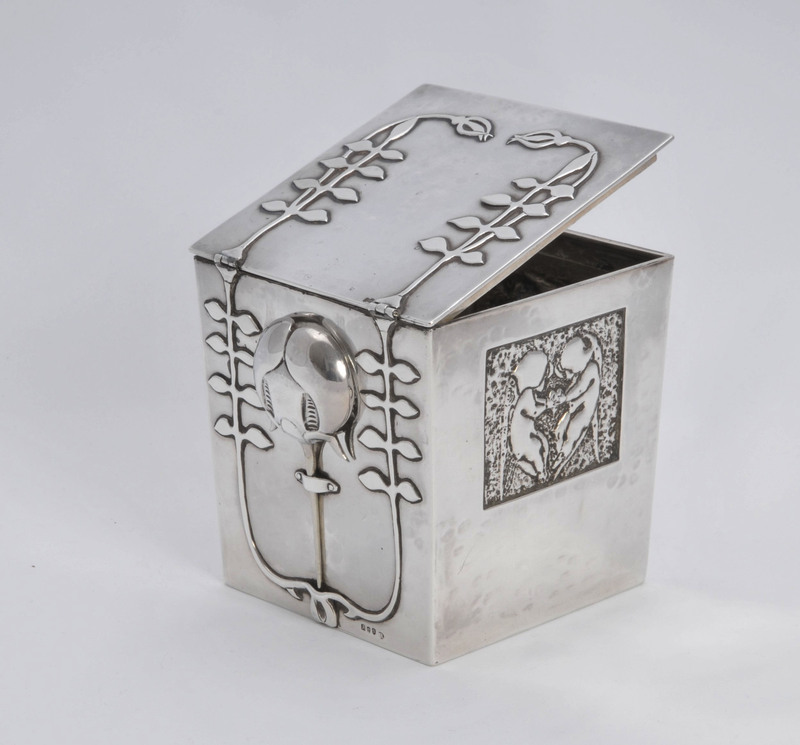 The caddy is hallmarked for Glasgow 1897 and was made as a wedding gift for James’ sister. The design is full of the symbolism of marriage and love. The design consists of applied stylised plant motifs intertwining. 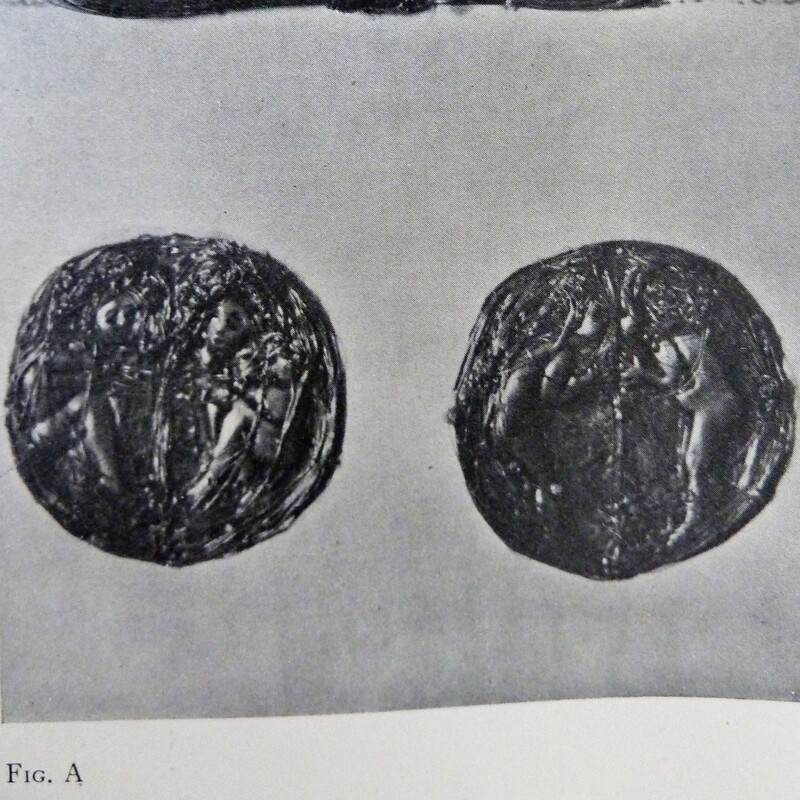 Three of the sides hold repousse panels; one showing a seated couple holding or giving a heart to the other, one shows possibly a mother and baby, a third panel is complex in its design and may have sexual connotations. The fourth side of the caddy holds a removeable caddy spoon symbolically in the form of a pomegranate. 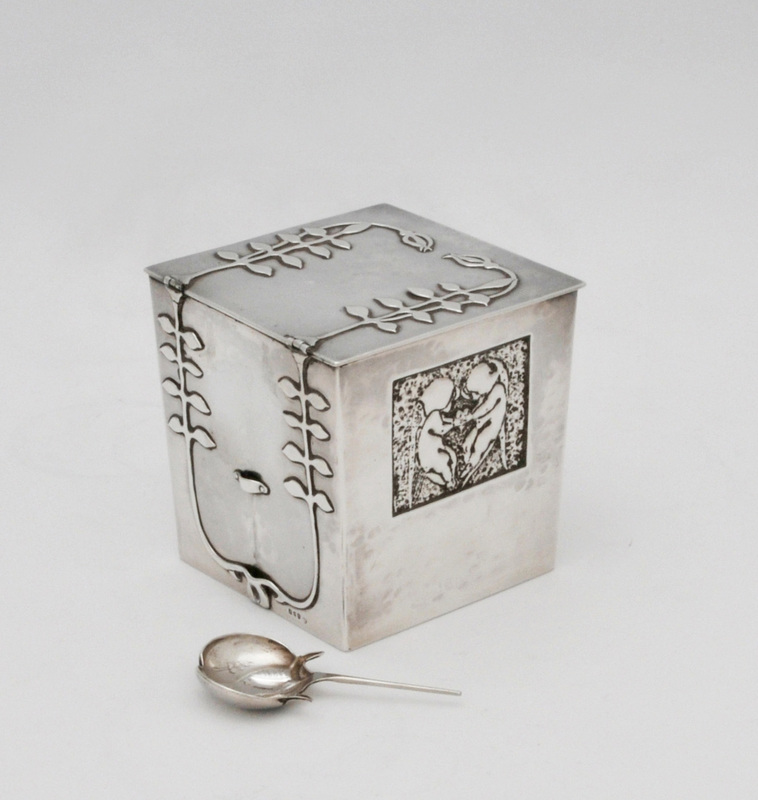 Maker: James Herbert McNair is thought to have made the piece himself. The caddy carries a silver makers mark which is rubbed but may be James Reid & Co. Possibly this firm had some role in the manufacture also or simply was used to register the piece with the assay office. Marks: What may be J.R makers mark, Glasgow city mark and 1897 date mark “A”. This caddy was first documented by Roger Billcliffe in 1970 when he wrote one of the first articles on James Herbert McNair, evaluating his contribution to the Glasgow Four and Mackintosh (Walker Art Gallery , Liverpool Annual Report and Bulletin 1970). At that time the caddy was owned by McNair’s niece. The same caddy was then exhibited at the Fine Art Society in 1979 and published in “Glasgow Style” by Gerald and Celia Larner. 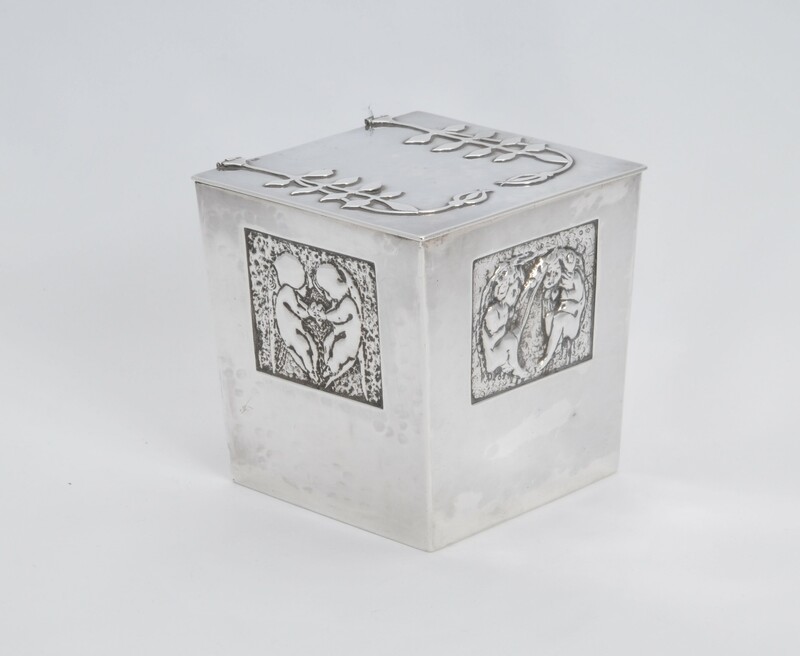 This same caddy was exhibited in the “Doves and Dream” exhibition of 2006 curated by Professor Pamela Robertson which explored further the work of James and Frances McNair. 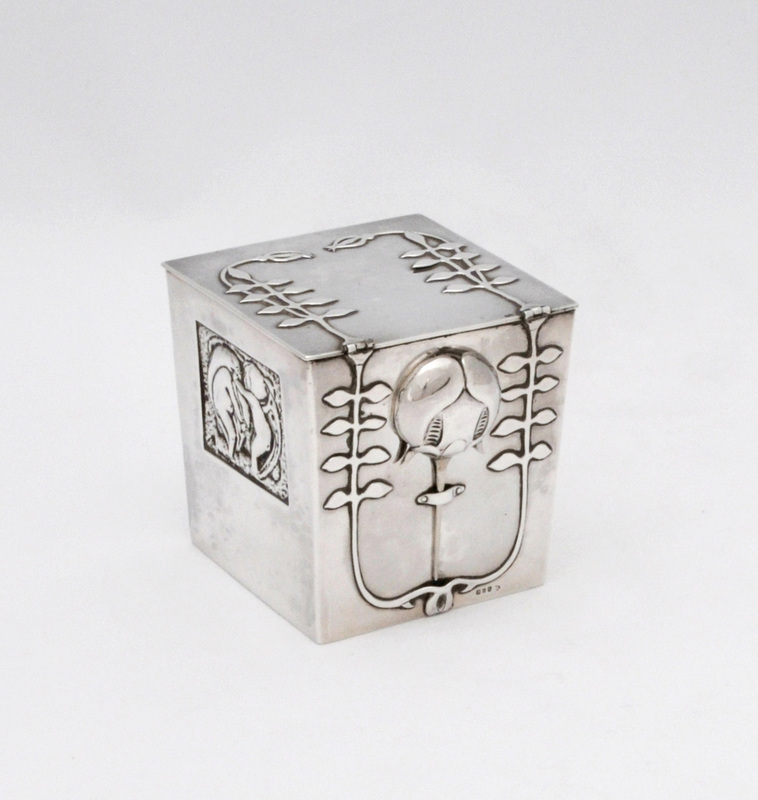 For the Fine Art Society Exhibition in 1979 Roger Billcliffe catalogued the caddy as follows: “McNair and the Macdonald sisters each designed and made one of the three relief panels on the sides of the caddy”. To date only the panel of mother and baby is attributed to anyone other than James Herbert McNair. The design of this panel is by Frances McNair with the signed drawing being part of Liverpool Museum’s Walker Gallery collection. Most recently a further unmarked caddy almost identical to this one has sold at auction. 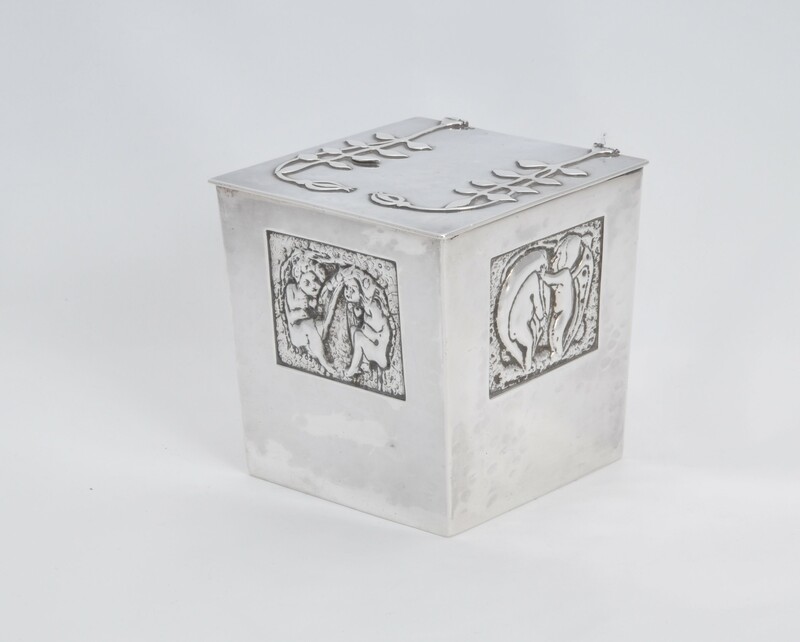 Made of a considerably heavier gauge of silver but unmarked, further research is ongoing as to its provenance; the likelihood being that this other caddy was also a wedding gift from James Herbert McNair to a close family member or friend.